The League of Women Voters of the Princeton Area and Princeton Community TV co-sponsored a forum among the Democratic candidates running for Princeton Council in the June primary election. Click here for a video of the forum. Sandy Smith convened the business meeting with highlights from 2018. We have eight new members and a Facebook page. 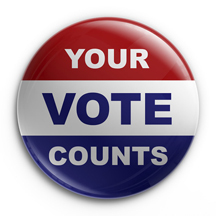 Our focus on Voter Service resulted in three forums, the publishing of fourteen races on VOTE411, the creation of a Speakers’ Bureau, and the registration of 700 voters, most of them high school students, in drives organized by Harriet Warner. For advocacy, we co-sponsored March for Our Lives in Princeton and participated in the Women’s March on NJ. Members then approved, without comment, the Princeton League positions, budget (see document on members' page on our website), and Leadership Committee. 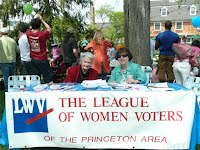 Lee Forbes, who worked on the LWV-Princeton Area Bylaws, acknowledged the leadership of Jennifer Howard and contributions of Sandy Shapiro and others, and explained that the revisions were needed to comply with LWVUS and to reflect the structure LWV-Princeton Area currently uses. The bylaws were approved. Because they require that a Nominating Committee be voted on at the Annual Meeting, the names of Sandy Smith, Chrystal Schivell, and Jeanne Turner were put forward and approved. The above documents and the dates of the next meetings were emailed to members and are posted on the League’s website. In introducing the speaker, Ingrid Reed noted that the Election Law Enforcement Commission (ELEC), which was created 35 years ago, is comprised of two Democrats and two Republicans appointed by the governor. If the governor fails to appoint, the commission is somewhat handicapped. The executive director must deal with this issue as well as seek funding from the legislature in order to carry out his charge to enforce election law. After thanking Ingrid and the League, Jeffrey Brindle said that since becoming Executive Director of ELEC a few years ago, he has been pushing for reforms that would strengthen political parties, reform pay-to-play, and require registration and disclosure by independent groups. He acknowledged the efforts of Represent Us in getting municipalities to pass resolutions supporting ELEC’s proposals. He also noted the support of state legislators that has resulted in the Singleton/Zwicker bills. Mr. Brindle contends that we can’t get money out of politics, although he and others might like to. The problem now is that money is flowing to PAC’s and independent, special interest groups. His solution is to see that money goes to organizations that are accountable. And it is the political parties that already are heavily regulated under NJ statutes and must disclose their financial activities. Parties also provide a guide for voters who are unfamiliar with specific candidates but who trust the platform of their chosen party. Thus he proposes an electoral system that favors parties and candidates, not independent groups and PAC’s. He warned that independent groups are secretive, accountable to no one, and now dominate elections in NJ because they out-spend the parties – by as much as 4 to 1. Perhaps anticipating that some audience members might argue that parties have a bad reputation and are not transparent, Mr. Brindle bolstered his thesis by pointing out that parties organize all levels of government and that, historically, strong party affiliation has been linked to high voter turnout. He contends that the rise in independent group activity in NJ and the accompanying decline in political parties may be contributing to NJ’s increasingly low voter turnout. 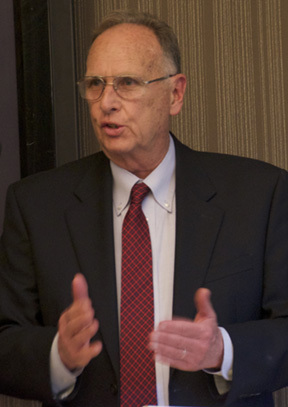 And in the animated and extended Q&A that followed his speech and did raise the issue of political parties having a bad reputation, Mr. Brindle suggested ways to make the parties more transparent: allow open primaries, restrict how parties use their money, and enact stricter laws regarding corruption. Lee Forbes thanked Mr. Brindle and presented him with a token of the League’s appreciation. Please click here for details of Mr. Brindle's speech. Please Click here for photos from the Annual DInner and Meeting.